Portland Wooden Boat Festival celebrates the final day of a Family Boat Build weekend, sponsored by RiversWest Small Craft Center, Oregon Maritime Museum and the Willamette Sailing Club. The event, which takes place on the banks of the Willamette River, will celebrate twelve families and teams, each building a Salt Water Bay skiff, with mentoring from expert wooden boat builders. Saturday the teams meet and receive their kits of supplies and commence building. Sunday they will launch their finished boats. On Sunday the festival includes a display of wooden boats from local boat builders and owners. Space is available on the grounds for canoes, kayaks and boats on trailers, as well as dock space for larger vessels. There is no charge to display a boat, but you must be registered before the event. In addition to the boat displays, the Wooden Boat Festival offers free sailboat rides and the use of paddleboards and other small craft, plus information about Portland’s maritime history. Live music, food, toy boat building for youngsters, and a beer garden round out the day’s activities. 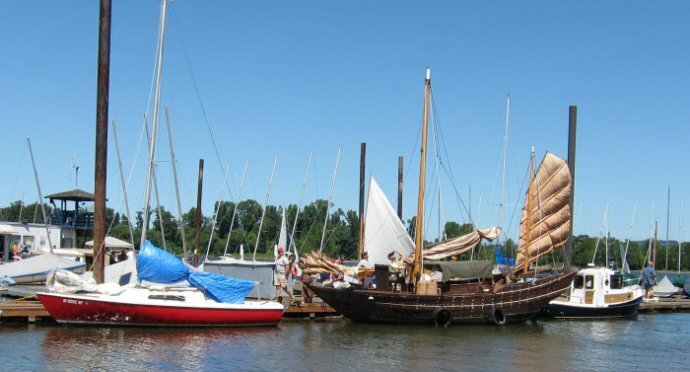 The Wooden Boat Festival runs from 11 a.m. to 5:00 p.m. Sunday, July 1, at the Willamette Sailing Club, 6336 S.W. Beaver Ave, Portland, OR 97239. Entry is free; guests are asked to park in metered spaces next door at Willamette Park.